It was a busy time. The holidays, the visitors, the prep, and it was a busy time. The holidays, the visitors, the prep, and the takedown, all demand so much time. In the midst of it all, you were involved in a motor vehicle accident. There was just no time to do anything. Sure you were sore the next day and the headaches never seem to go away, but you just cannot get to the doctor. You definitely do not have the time or money to see a lawyer. Now that the holidays are over-is it too late to do anything about your motor vehicle accident? You should definitely see a doctor if you have ANY pain after a motor vehicle accident. Sometimes, there is no pain at the motor vehicle accident scene, but after a few days, the pain sets in. See a doctor immediately whether that means you have to go to an urgent care center, your primary care physician or even the emergency room, you must go. You need to find out what is really wrong, and treatment is usually the only way to improve after a motor vehicle accident. 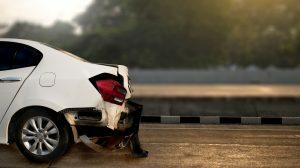 What about a legal motor vehicle accident claim? You waited a few days, weeks, months, can you still do anything? In Pennsylvania, you have 2 years from the time of the motor vehicle accident to file a complaint, but if you wait to see a lawyer for too long he or she may not may able to help you. After you seek medical attention you should see an attorney to find out what rights you have. O’Donnell Law Office attorneys work on motor vehicle accident claims everyday. They make time to see you when you can see them, and often meet you at the hospital or your home, if you cannot come to the office. And there is NEVER any fee until you win. So there is reason to put it off any longer. You may be risking your health and costing yourself money. Stop rubbing your neck, and call us at O’Donnell Law Office 570-821-5717.